A portion of an illegal dump at Falls Road, Philadelphia, just off the Schuylkill River that was cleaned up by Dec. 2018. 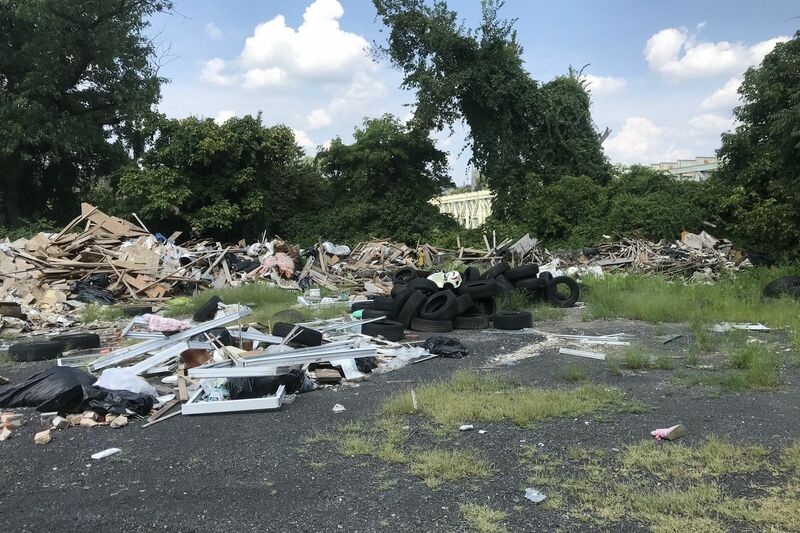 Philadelphia has a problem with illegal dump sites that pop up along the banks of the Delaware River and the Schuylkill, but one on a site cleaned this month was “eye-popping,” according to the Water Department: a 245-ton behemoth of tires, construction debris, and just plain old trash. On the west side of the Schuylkill, just north of Falls Bridge, the dump was situated between two of the city’s three main sources of drinking water, according to a recent announcement by the department. Maria Horowitz, an environmental engineer with the department, said the city first learned of the dump along Falls Road in May. But officials thought it would be best to wait until leaves had fallen so the site would be more visible to cleanup crews. The timing was also better for community groups and volunteers. “It’s probably less than 20 feet from the river,” Horowitz said of the site, which had been cleared to use as a staging area for railroad companies before others began using it as a dump site. Horowitz began coordinating a cleanup with the Zero Waste and Litter Cabinet, an interagency group with representatives from city government and the community. Volunteers were organized with help from United by Blue, a Philadelphia company that sells sustainable outdoor apparel and gear. Norfolk Southern, the rail company that manages part of the site, also helped. Starting in the fall, city workers used heavy equipment to remove large items and push the rest of the trash into more manageable piles, some reaching up to eight feet in height. They also added Jersey barriers to stop dumpers from getting into the area. In all, about 100 volunteers worked to pull out plastics and recyclables, and get rid of small debris. Horowitz says the trash came from multiple sources, though she couldn’t identify specific dumpers. Along with securing the site, cameras will be put up in the area to discourage or catch — future dumpers. The first clean-out in late September lasted three days, with crews pulling out 377 tires — 11,000 pounds — that were recycled by Bridgestone Tires, and 1.35 tons of recyclables and other debris. In all, 227 tons were removed in those initial three days. On Dec. 1, crews helped clean out five more truckloads of debris, including 105 tires, weighing 17.2 tons. The city calculates that the total haul would be the equivalent of 32,700 households each dumping a 15-pound bag of trash along Falls Road. Illegal dumping is of particular concern near the Schuylkill and Delaware River, since the city draws drinking water from them that is processed at three treatment plants. The Schuylkill has two intakes: One along Kelly Drive in East Falls that feeds the Queen Lane treatment plant, and a second in Wynnefield along Martin Luther King Drive that feeds the Belmont Plant. Together, they account for 40 percent of the city’s drinking water supply. The illegal dump cleaned by the crews was located between the two Schuylkill intakes. A third intake, which feeds the Baxter Plant, is on the Delaware River in Torresdale. By state law, the Water Department must assess any threats upstream of the intakes to ensure no contaminants or chemicals get into the supply. Kelly Anderson, Watershed Protection manager for the Water Department, said this kind of dump site is not common along Fairmount Park, but is a high priority because of its proximity to the drinking water intakes. The Water Department coordinates with Parks and Recreation to maintain most of the land around Kelly Drive, and throughout Philadelphia’s park system, including parks that border city waterways. “You have properties that are still owned by someone but abandoned and tucked away,” Anderson said. “Most are not very visible to the public. This was an exception. It was visible not only from Falls Bridge, but the Schuylkill River Trail." She said the materials in the dump did not appear to contain chemicals and did not pose an immediate threat to the water supply. “But you never know,” Anderson said of other dumps that might pop up.